1 For at least four thousand years, people have treasured silk. Chinese legends say that in about 2640 B.C., a Chinese empress saw a silkworm cocoon accidentally fall into her tea. She watched the thread unravel in the warm liquid. She had discovered silk. 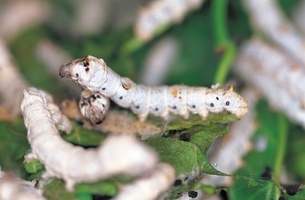 But for thousands of years, the Chinese people kept the work of silkworms a secret. Death was the penalty for telling the secret. 2 Long before the rest of the world learned how silk was made, the Chinese were trading this treasured fabric with people west of China. Merchants who bought and sold silk traveled along a system of hazardous routes that came to be known as the "Silk Road." The Silk Road stretched almost 2,500 miles (6,400 km.) from Chang'an (Xi'an) in China to Rome, Italy. Silk, furs, and spices traveled west toward Rome along the road. Gold, wool, glass, grapes, garlic, and walnuts moved east toward China. 3 Travel along the Silk Road was treacherous and difficult. There were many different routes; it was not a single road. For safety, traders traveled in caravans of many people and animals. Some kinds of pack animals were better equipped to handle certain parts of the journey than others. Camels, for instance, were well suited to the desert. They could store large amounts of water and withstand most sandstorms. Yaks were often used in the high mountains. 4 The entire journey along the Silk Road could take years. Many people and animals died along the way. Very few individuals or caravans traveled the whole length of the Silk Road. The route spanned China, Central Asia, Northern India, and the Parthian and Roman Empires. It connected the Yellow River Valley to the Mediterranean Sea and passed through places such as Chinese cities of Kansu and Sinkiang and the present-day countries of Iran, Iraq, and Syria. This important trade route led to the exchange of knowledge and cultural and scientific ideas.